'I thought you were entertaining someone up there in your coils,' Shere Khan the Tiger purrs malevolently (with the unmistakable voice of George Sanders) as Kaa the Snake endeavours to squeeze Mowgli the Man Cub in his horrible clutches. This animated Disney feature based on Kipling, the last to be supervised by Big D himself, is chock-a-block with such shapely lines (with Baloo the dim-witted bear, voiced by Phil Harris, getting the best). 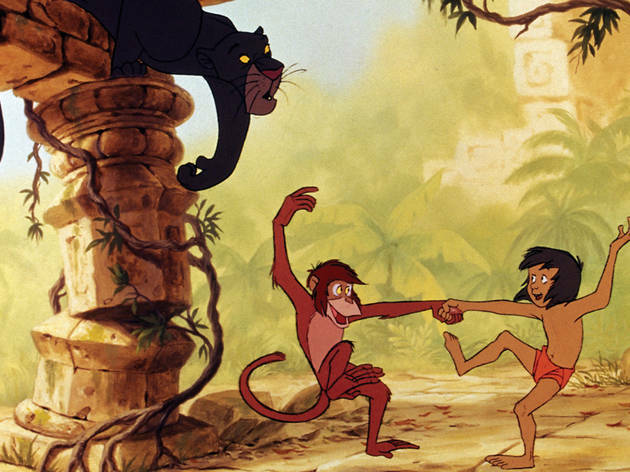 It's also got great knockabout visual gags, mercifully little cutey-poo sentiment, and reasonable songs, including 'The Bare Necessities'. 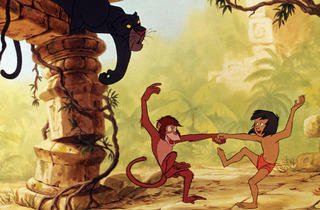 The animation has only the bare necessities, too, and the storyline is weak, but it doesn't seem to matter much. The Jungle Book, based on a series of stories by Rudyard Kipling, feels more like a number of vignettes than a cohesive plot - likely due to the hotch potch nature of its source material. But who really minds when the scenes themselves are amusing and contain such excellent songs? There is swift movement in this short film, and it's impressive that so many scenes and characters are included in just over an hour. The wolf pups open with cuteness, bagheera offers the life lessons, Baloo the comic relief and Shere Khan the malevolence. As noted by Time Out, the animation isn't the most developed (the same shot of a waterfall is reused three or four times!) and the score a tad repetitive. But in all, it's an easy and enjoyable way to spend 70 minutes and is a golden oldie for a reason.